"Yummy, healthy, comfort food. 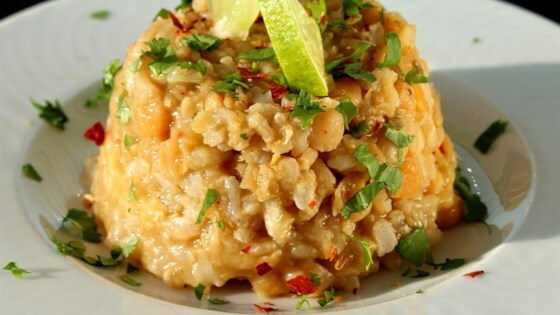 This simple dish of beans and rice is tasty and helps cleanse the body and heal digestion for all body types. I also love this dish for an easy, healthy, pantry meal I can throw together when I have nothing else in the house. Top with ghee, salt, liquid aminos, or whatever you like. I like lemon pepper, sriracha sauce, and feta cheese." Combine water, basmati rice, split mung beans, ginger, coriander, oregano, garlic, cumin, and fennel seeds in a saucepan. Bring to a boil; reduce heat to medium-low. Simmer, covered, until most of the water is absorbed and the mixture has a smooth consistency, 20 to 25 minutes. Chef John’s easy version of the San Fran treat! Substitute vegetable stock for the water if desired. Substitute red lentils or split peas for the mung beans if desired. If using whole mung beans or brown lentils, adjust time to 45 minutes and use brown rice instead of white. Substitute 1/2 to 1 teaspoon coriander seeds and 1/4 teaspoon cumin seeds for the ground coriander and cumin if preferred. If you like, as rice and beans are cooking, chop and add veggies such as carrots, zucchini, and broccoli for the last 5 to 10 minutes of cooking. My favorite is to add a cup or so of frozen peas right after it's done cooking and let them heat through. Did not change anything initially, but it turned out Incredibly bland. Had to add tons of seasoning and other herbs to give it any sort of flavor. I did make changes. I fried I small chopped sweet onion, and added turmeric to the spices. It was delicious. This is an excellent recipe. I used whole grain rice. The flavors and texture are soothing and delicate. I topped with hot peppers, lime, and fresh coriander leaves. Thank you for the recipe.